My real name is Rodney Cathey, Doc Blakey is my stage name and I was born in Columbia, Tennessee � known notoriously around the USA as �Mule Town�. We have an event there that�s called the Mule Day Parade. It�s actually what put Columbia on the map. Mule Day years ago was the day where they sold slaves, mules and horses but now people celebrate it and they have parades, but a lot of people don�t know the true origins of it. In a small town 45 miles south of Nashville that is racially divided, I had a typical childhood for a lower middle class black family. My father was a farmer and he also worked for the local railroad company there. When I was born he was still in the Vietnam War. The day I was born the military phoned my mother and told her that he had been shot, but a week later they told her that they had the dog tags mixed up and it wasn�t him that had been shot but it was someone else. Music was around and it was a part of my life, there was always a guitar or set of drums or a harmonica around the house. The neighbourhood I lived in was really small and everyone knew each other and we went to house-to-house. I went to my Grandmother�s and there was a set of drums there, and I went to my aunt�s house and there were instruments there. There was something to play music with everywhere. I had this grandmother and we thought she was odd, and she had this raggedy house that was kinda outside of the neighbourhood. She called it Gods Mission House and we had to read from the Bible. She had a piano where a lot of keys didn�t work and she would make me play that thing while my brother would sing. She would play a Jaw Harp and we would get tunes going and this was my earliest recollection of playing music. Two of my mother�s brothers and five of my mother�s mother�s brothers would play those house parties. 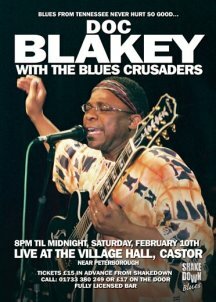 They were all really good musicians, playing blues with a bit of what was going on in the music world in the 1970�s. They were just local blues artists, like so many blues guys that are not known outside of their hometown. Those guys were such an inspiration to me; as a matter of fact, one of the songs �Going Down To Louisiana� off my CD, that groove was a groove that my uncles would play, they would always play that rhythm when they was jamming. I have always played around with the harmonica and piano, my grandfather played around with the harmonica. I would pick up the guitar at times and play some chords. I was doing a little bit of everything back then. We got together with other musicians in the neighbourhood and just jam, we didn�t think we were good enough to go out and play. We would have fun playing outside in the backyard or set up in the front porch or something. I didn�t get really serious at playing guitar until I graduated from school. I earned an academic scholarship to go to the University Of Salamanca in Spain and I went there for two years, but I got so homesick I couldn�t deal with it. I ended up losing my scholarship and getting back home, and I didn�t have money to go to college � my family couldn�t afford to pay for it. A friend of mine convinced me to go out and sell drugs to make the money to pay to get into college so I tried it, but I was a country boy and I soon got busted by the cops. I got scared of going to jail, and later I learnt that I didn�t have enough drugs on me to make me go to jail. But I made things worse and I jumped bond as I didn�t want to go to court. So I went on the run. While I was on the run I did a couple of things that aggravated matters, and being on the run it just turned into a worse situation. First place I went when I was on the run was Atlanta and I met blues singer Theodis Ealey. I was in a bar that night at Blind Willies and you could sit in and jam, and there was lots of hot women in there as well. So I went there and there was this good looking lady sitting at the bar, and I finally worked up my nerve and talk to her and it happened that she was Theodis� wife, and by that time he was walking off the stage towards me and I had to play it off because I was kinda scared trying to hit it with his wife. So we ended up good friends and he invited me over to his house, as he liked to see us young cats play. He also used to have a day job doing maintenance stuff and he used to play music at night, which was a surprise to me as he was one of the best blues artists in Atlanta. He used to tell me that I didn�t need no lessons on the guitar because I was already picking guitar good. So Theodis started working with me and we became really close friends but I told them that I hadn�t seen my family for a while because I had been on the run. I told them the whole story. Theodis told me he would be my friend no matter what, but he also said that if I wanted to do anything as a blues artist and go to the next level of getting better known that I should turn myself in. I got pissed off with him first and we talked. I eventually turned myself in. Theodis told me that when I�m in prison I would have all the time in the world to play better and when I was released from prison he would support me and that he would have his Ifgam record label going. They initially gave me eleven years because I had been a fugitive, but they ended up giving me a sentence reduction because of good behaviour. They have a system in prison where you could get paid and they offered me a job in education so I worked with Spanish prisoners teaching them English and also worked as a Spanish tutor teaching those who wanted to speak Spanish. I also played guitar and practised religiously for about five years. Needless to say, when I got out I was really good or I thought I was. I was out for a few months and I contacted Theodis. During my time in prison Theodis was doing well and he was past having to work a day job and he had a record label that was starting to become very strong. He was hitting big with that song �Stand Up In It� on his Ifgam label. I went back to Nashville and got a band together and started practising and four months later Theodis got us into his studio but I wasn�t really ready. He told me I should study Albert King, which I did for another couple of years and by that time I had become good. Theodis started to fund the album project in the studio, so we recorded the album �Blues Never Hurt So Good� on Theodis� Ifgam label. I never played in his band but I would sit in with him, I would he with him wherever he went, I would sell his CD�s. I was like his roadie. For my CD � �Blues Never Hurt So Good� I had the Memphis Horns on there. Johnny Neil at the Straight Up Sound studio, he had all the best guys come in there, and the Memphis Horns were in town doing a project and Johnny asked them if they would play as we needed a horn section. They charged us an arm and a leg but they came in and blew on that CD. Waldo Weathers was featured on sax on the number �Going Down To Louisiana�. The CD has led me to more work � it has led to a lot of club gigs in the States. I particularly do festivals. Theodis helps manage me and I�m looking for a good management company as well. I have my own band but I don�t stay as busy as I would like to. Music is not a full time thing for me at the moment. I �m a pro though; when I�m not doing music I do another job to sustain my family. I work as an interpreter. I�m on call for the local hospitals and police departments and things. I�m forty at the present and there are not a lot of young black guys that I know of that are out there playing blues. Johnny Jones is my idol. I talk with him every day, and whenever I go out to do a show or a festival I take Johnny with me to play with me, he doesn�t get the attention or the gigs that he should. I bought this amp some years back and this guy told me to plug the amp up and he took me to a restaurant, it�s called The Modern Era, and we took the amp in there and there was this big old black guy toting this big old pan with turnip greens in it and he started washing the greens. And this guy introduced me to him, and he started cussing me out, saying I was too young to play the blues. So I sat down with him and he plugged the amp in and he took the guitar and played some fancy licks and he really impressed me, and that was the first time that I met Johnny Jones. After that I went out to see Johnny perform often and I would follow his moves and watch what he was doing. I would sneak in a tape player to record his playing, trying to get his phrasing. Charles Walker, Al Garner, all these guys are Johnny�s buddies. Another good friend of mine is James Nixon, he is another one of my mentors and he hosts a blues jam in Nashville. He has been a very important part of my formative years as a musician. These guys are my heroes and they seem to want to pass their music on to me.